If you’re like me, you’re usually happy for any excuse to get to work on a card, but this is one of those that I imagine none of us likes to have cause to make. Certainly, when I first came up with this design a couple of months ago, I found it hard, creatively and personally, as the recipient was a very dear family friend who I knew was hurting immensely. Having said that, I think making a sympathy card to show you care can be a helpful thing for the giver and the receiver- our friend appreciated all the thought and effort that she knew had gone into the card and the love that came with it and creating a card that would convey that helped me to feel a little less useless (as there is very little of any practical value you can offer in my position), too, when I was stuck at home while my mum was doing what she could to help in a more easily tangible way. That time, back in September, I thought about blogging the card and even took the photos, but in the end I just didn’t feel I wanted to. However, a couple of weeks ago, when my mum needed a card for a good friend, she asked me to make another of the same and I thought I would post this one as I can look a bit more objectively at it this time. Also, I know, though the first time I saw a sympathy card on a blog I was a little surprised, that I’ve now come to really appreciate the help being able to look at others ideas is when you’re trying to make this of all kinds of cards. It’s a pretty simple design, as I always tend to think a sympathy card should be. I think I’ve found an okay balance- keeping it simple but with enough detail to show that real care went into it. I used some very lovely Hi-5 Pearl card and paper that has a subtle shimmer and two-tone purple/pale green effect that seemed to suit the card as it’s not as ‘pretty-pretty’ as some of the other purple pearl card I’ve got, along with a little silver mirror board (not something I’ve ever considered for a sympathy card before but it seemed to work okay, would you say?) and my C’bug and Nesties. 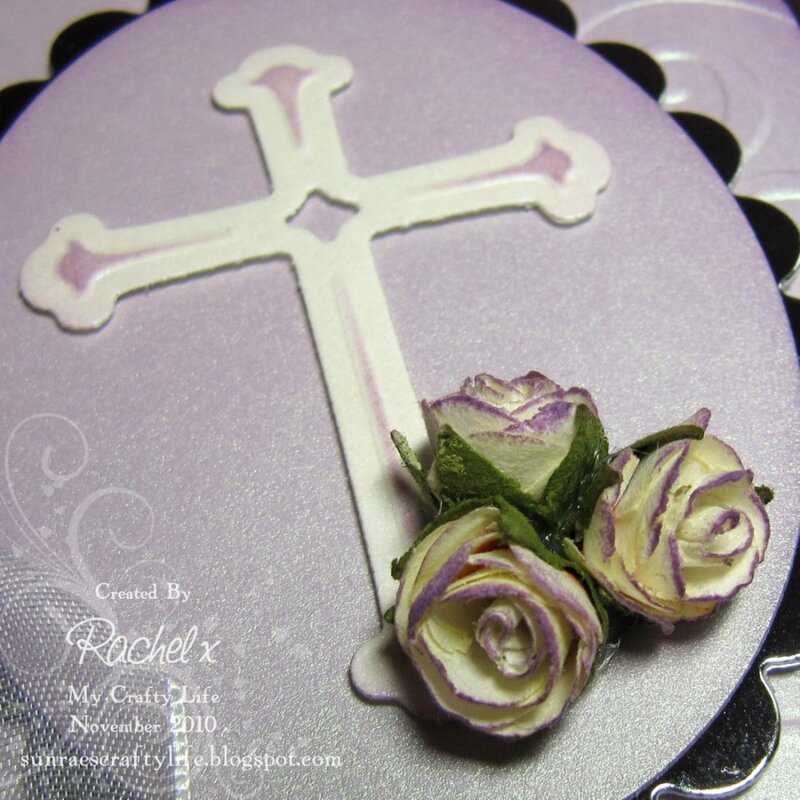 The background is embossed with the D’vine Swirls C’’bug folder and the ovals cut with Nesties. 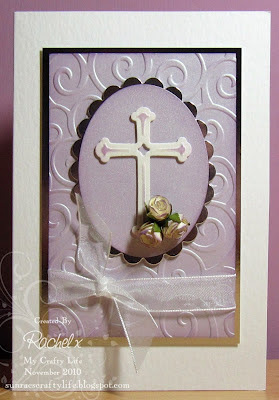 I very lightly edged the purple card with Dusty Concord DI to lift the colour a little and give it a bit of definition. 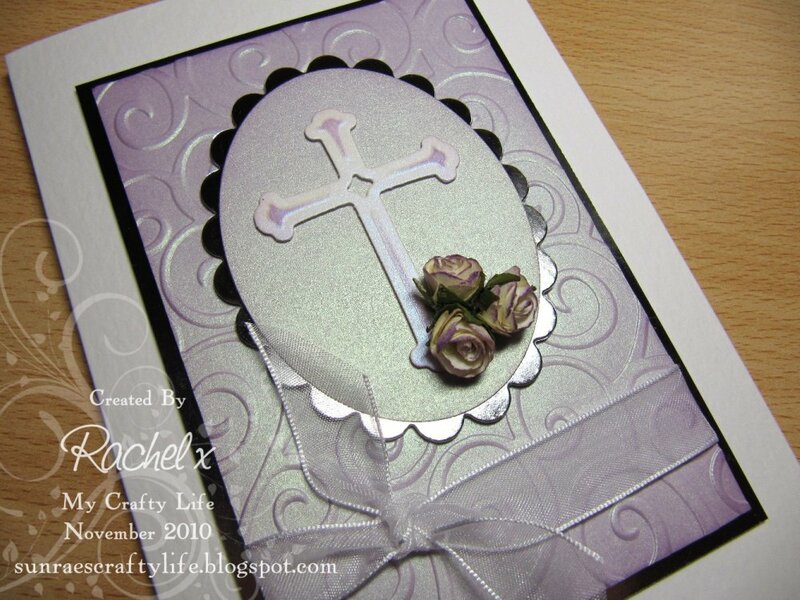 The cross is cut with a Spellbinders set that my mum bought so that I’d be able to make cards for her to give for Christenings, Easter and, of course, sympathy cards when she wanted the religious element included. I ran it back through the bug with the embossing mat then inked with Dusty Concord through the die and also very lightly around the edges when I’d removed it from the die, too. The flowers were either in the candy I won back in May or from Joanna Sheen and, though I haven’t used flowers like this much yet and wasn’t sure if they might seem too much, I decided they would work for a card for somebody special to us. They’re off-white and inked with the same ink to tie them in, too. Then, just a little white organza ribbon to soften the lines of the main panel. I decided against a sentiment when I made the first card, as all the usual ones I have stamps for just didn’t quite sound the way I wanted, and mum was happy with that for this one, too. So, that’s my card and I hope I haven’t bored anyone too much by writing so much- not sure I meant to but it does help to organise your thoughts sometimes. This is really lovely and very elegant. Thanks for joining in the Charisma challenge this week. Such a lovely card, thanks for joining us at Charisma this week. It's a Blog! A new Blog! All content and design copyright Rachel x / My Crafty Life. All rights reserved.